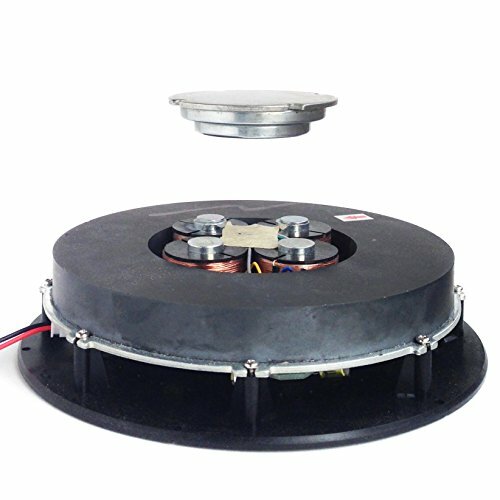 Levitation Device User Notes: Levitation is achieved when the center of the disk is lowered directly over the center of the base. It can be a little tricky to find the levitation sweet spot, but with a little practice it becomes easy. IMPORTANT: Do not levitate the disk without placing some sort of padding over the base. The exposed magnets will be damaged if they slam directly into each other! There are multiple examples of boxes/enclosures that you can build for the base magnet on our website. Make sure that the base is plugged in and keep metal objects away so as not to interfere with the magnetic field. Hold the magnetic disk about 15cm/ 6 inches above the base. Lower the disk with both hands directly over the center of the base, keeping it level until you feel the upward magnetic force supporting the weight of the disk. Gently let go keeping it centered and level. If it falls, simply lift the disk up and try again. Expect that it will take several attempts and may require some practice to master. Do not block airflow to the bottom of the base. Also, this is not a toy- keep out of reach of children! Feel free to reach out with any questions! If you have any questions about this product by LEVdisplay, contact us by completing and submitting the form below. If you are looking for a specif part number, please include it with your message.